As most people on this planet know quite well, St. Valentine‘s most popular symbol is the heart given that he is the patron saint of love, married couples, engaged couples, etc. 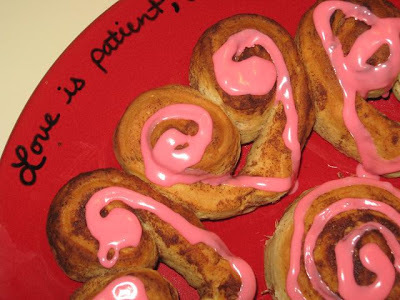 Here is an easy breakfast treat we made for celebrating the feast day of St. Valentine! Take each pre-sliced cinnamon roll, and unroll it. Then, roll from both ends until it meets in the middle. Pinch the bottom for the “point” of the heart, and then bake as usual. To add a little more fun, tint your icing pink with some food coloring and put it in a sandwich bag so you can squeeze it on in a heart shape! Tried these with my class today. Problem was, though the brand was pre-slided, it didn’t unroll. It was one solid chunch of bun. I had to cut 16 cinnamon rolls on the fly while the kids waited. Patience, thy name is not 4th grader. lol What brand did you use above that unrolled so nicely? Thanks! That is so weird! I’ve never heard of cinnamon rolls like that. 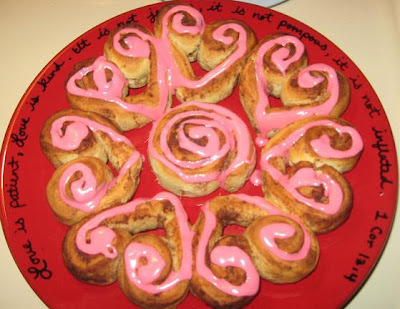 I suppose if they didn’t roll, they weren’t actually cinnamon rolls…. more like cinnamon biscuits or something. I had the same problem with pillsbury. They were sliced but wouldn’t unravel. What brand did you use?